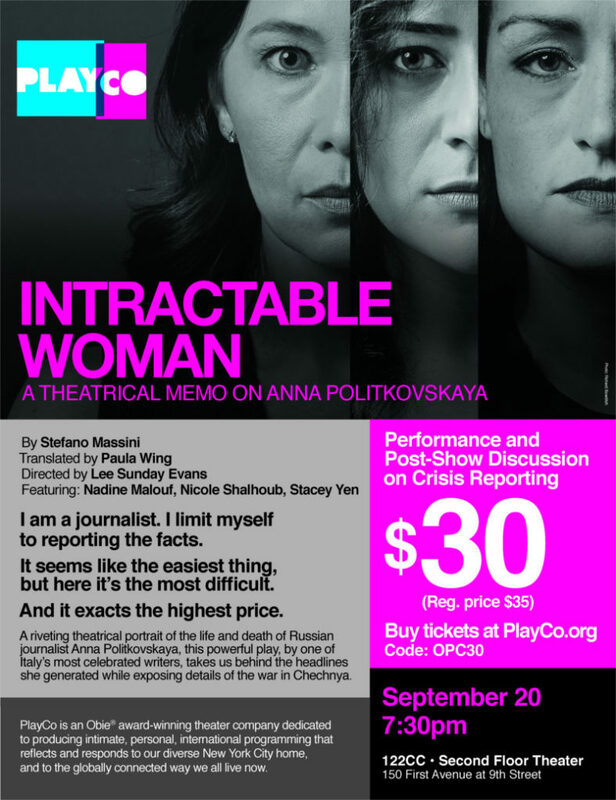 The PlayCompany (PlayCo) reserved a block of tickets for OPC members at discount prices on Sept. 20 for Intractable Woman, A Theatrical Memo on Anna Politkovskaya. Anna was a Russian journalist who was murdered in Russia for her brave coverage of the war in Chechnya. Following the performance, a panel of journalists will discuss their experiences covering conflict and corruption in Russia and elsewhere. Judith Matloff, a journalism professor at Columbia University and author who has specialized in writing about regions of conflict, will be the moderator. Panelists include: Zach Fannin, a freelance journalist who won several awards for “Inside Putin’s Russia,” a PBS NewsHour series; Misha Friedman, a photographer who has worked extensively in Russia and Ukraine; and Elena Kostyuchenko, a special correspondent for Russia’s Novaya Gazeta (where Anna Politkovskaya worked) who covers conflict and gay rights. She is the 2018 Paul Klebnikov Russian Civil Society Fellow at Columbia’s Harriman Institute. Note: People can attend the panel for free even if they did not see the play. Intractable Woman is written by the Italian playwright Stefano Massini and directed by Lee Sunday Evans. The production will be staged at 122 Community Center (formerly P.S. 122), at 150 1st Avenue in New York.